As a boy, I used to feed my imagination with books. Poring over the pages I’d discover the depths with deep sea divers, soar with winged dinosaurs and clamber through ruined jungle temples and lost kingdoms. I could travel into space, march with mighty Roman empires and battle with medieval knights, all from the comfort of my bedroom. I also distinctly remember reading of real life dragons from a far off land; legendary beasts with forked tongues and ferocious fangs, something which back then was as fantastical as the rest. Fast forward twenty years however, and I found myself crouched on a grassy tussock on a remote island in the tropics looking at one of those exact same dragons. It seemed an awfully long way from the wide eyed childhood stories on the other side of the world to being here, close enough to see the veins in its eyes, but I’d finally arrived at Komodo Island. The dragons, or Ora as locals know them, are unique to this part of the world. Aside from Komodo island, neighbouring Rinca and a smattering on nearby Flores they’re found nowhere else in the wild, making their sighting all the more impressive. Yes, you can now fly straight from Bali to the airport at Labuan Bajo, the local jump off point to the islands; but having made a 32 hour journey over land and sea from Lombok to get here, the sense of adventure upon setting off to Komodo on a chartered local boat was very much a real one. Our crew had pretty much formed itself. As the only eight bule (westerners) on the ferry from Sambawa to Flores, it was evident we were all here for the same reason and an alliance was formed. It’s not uncommon for boats to sink here, so after surveying our options and some furious negotiation, we had ourselves a seaworthy vessel and the next morning set sail. 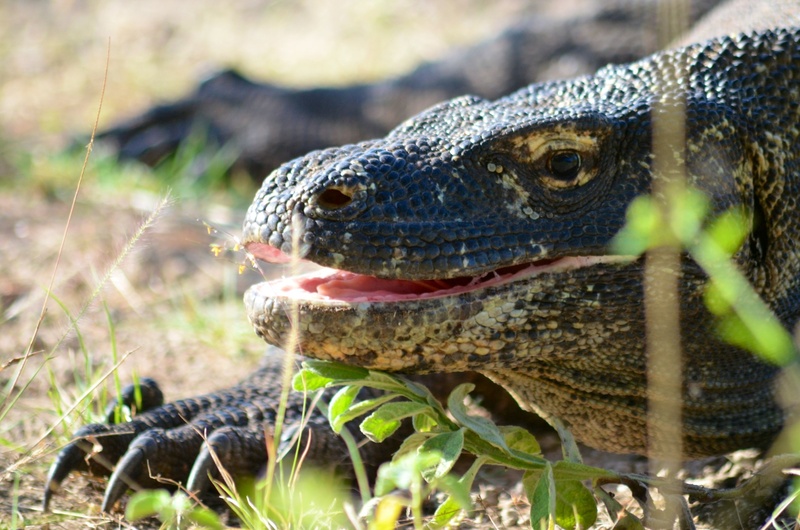 Komodo dragons will quite happily eat you, this is something that’s generally worth remembering. Local villagers have fallen victim in the past, a seven year old boy quite recently, and there have been reports of other non fatal attacks too. A warden here was attacked at his office desk a few years back, something which makes your standard repetitive strain injury complaints at home seem quite futile. The warden survived, however having had some recovery time off work before returning to his duties was then attacked again in the same manner. If ever a career change was needed I think this was it. With this in mind we kept in close proximity to our guides, each armed with the not so reassuring defence of a stick, and set about finding some dragons. The first one we saw was on Rinca. Hanging around the camp of wardens huts was a two metre lizard, eyeing us warily from the grass. In years gone by the Ora were tempted in front of tourist cameras by being fed goats, but it’s not a practice that goes on these days. Nonetheless, this one seemed pretty comfortable in his surroundings and there was a definite sense that he was more than an occasional visitor – it wasn’t quite the wild encounter I’d imagined. We trekked further inland in search of more, but having arrived at around midday with the sun at its hottest we saw nothing further except for some fetching views. Having spent the afternoon snorkelling with large turtles, clownfish and sting rays at nearby Pink beach, we moored up overnight close to Komodo island. 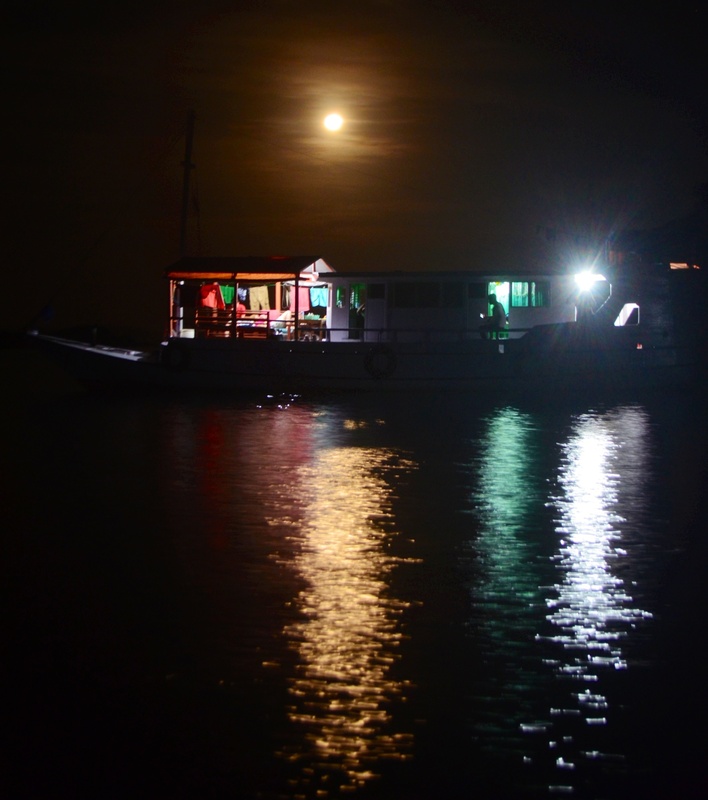 As masses of Flying Foxes retuned to roost overhead, we watched an almost full moon rise over the Flores Sea and settled in for a night on the deck under the stars. Rising early with the light, we arrived for some trekking shortly after dawn and as a result fared much better. Within minutes we’d seen an infant dragon head poking from the safety of his tree top hole – they’re a cannibalistic species, with youngsters prime target – and another larger lizard soon after. It was further inland that a real sense of wilderness took hold however. Arriving on a hill top with unbroken views over the island and surrounding seas, there was a large dragon warming himself in the early morning sun. It looked immense. Even as it dozed, there was no hiding the thick, powerful legs, ferocious claws and the sweeping, muscular tail. Thick scaly skin covered the length of his body, his head merging into the rest by way of a stocky neck which crumpled around open ear holes. He awoke and yawned, and while the teeth remained hidden from view, there flicked a forked tongue coated in the bacteria ridden saliva which forms another part of its impressive arsenal. When unable to fell bigger prey alone, such as a Water Buffalo, a Komodo dragon will simply bite it’s victim, pull out a chair and crossword, and wait. Progressing from open wound to infection, the Buffalo will eventually weaken to the point of collapse, essentially serving itself up on a plate. This can take weeks. It’s a feeding process of great patience, desperation and awful misery – much like a visit to McDonalds for you or I. We saw another dragon soon after, partially hidden in bush, before descending to the beach side warden’s camp where we counted eight, maybe nine, more. Despite the insistence from our guide that “they just like it here” there was still the sense of something not quite so wild and natural, just as on Rinca. 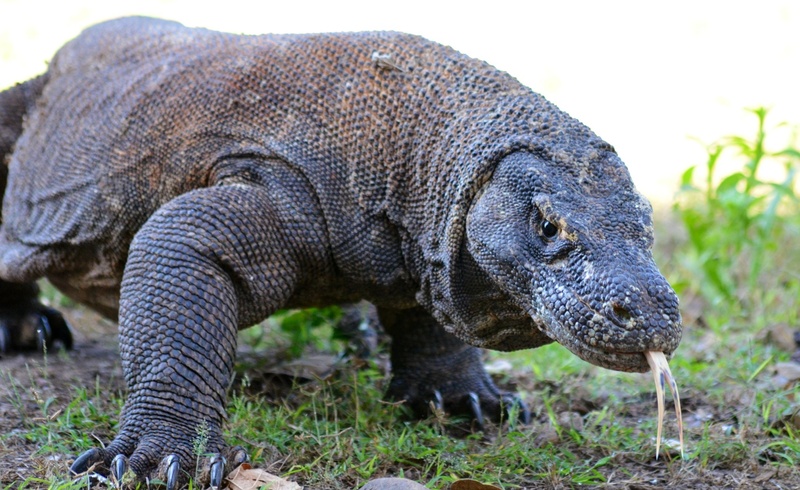 Still, being surrounded by so many Komodo Dragons is not an experience to be forgotten – an ambition had been achieved, a childhood fantasy realised. The adventure hadn’t ended yet however, as we moved from beasts of the land to beasts of the sea. The waters around this idyllic archipelago off the coast of Flores teemed with life. We made for Manta Point next, where we found an uncountable amount of Giant Manta Rays. They were magnificent. Huge rays measuring metres across glided over the seabed before swooping effortlessly upwards with the currents. From there we made tracks to Labuan Bajo, passing more Mantas and Turtles along the way. Flying Fish and Sprats exploded through the surface regularly while a small pod of Dolphins came and went. It had been a truly humbling couple of days – as wildlife expeditions go then surely this couldn’t be bettered. Or could it? From Flores we were bound for Borneo and a visit to perhaps the greatest childhood story of all – we were off to discover a real life version of The Jungle Book. Hi – thanks for the comment. I don’t see it on my browsers at all so it might be your end. Also, I don’t maintain or use that website any more – all those posts (plus a load more new ones!) are over on allyrambles.wordpress.com – so it might look better there?